It’s time for an old favourite! Raincheck Lounge has been our ‘go to’ venue for a long time. Whenever in doubt, go to Raincheck! More often than not our occasional visits have coincided with a movie at the State Cinema just across the road, but in this case we were there purely for the food. No better excuse needed! Something that Raincheck Lounge do very well is their ‘Chef’s Table’ menu, and we keep a keen eye on their Facebook page to see what awesome little delicacies they want to throw at their customers each week! BUT! Even better is their Chef’s Table menu. This is a menu that they use as a vehicle to show off what’s fresh, in season and likely to make your taste buds sing! For only $70 for two people for four(!) courses (including some great sourdough with oil and balsamic), it’s also great value! The menu won’t appeal to everyone, as it can be quite diverse, but if you keep an eye on their Facebook page I can guarantee that something will come up that will take your fancy! The other great thing about the Chef’s Table menu is that they also pair the food up with some interesting wine selections by the glass or bottle. A great opportunity to try a wine that is either uncommon (as many of them are not Australian) or just a little bit different. As you’ve probably guessed, we decided to go with the Chef’s Table menu. The accompanying wine was a 2008 montelpulciano/sangiovese blend from Brecciarolo, Italy. Yes please!! 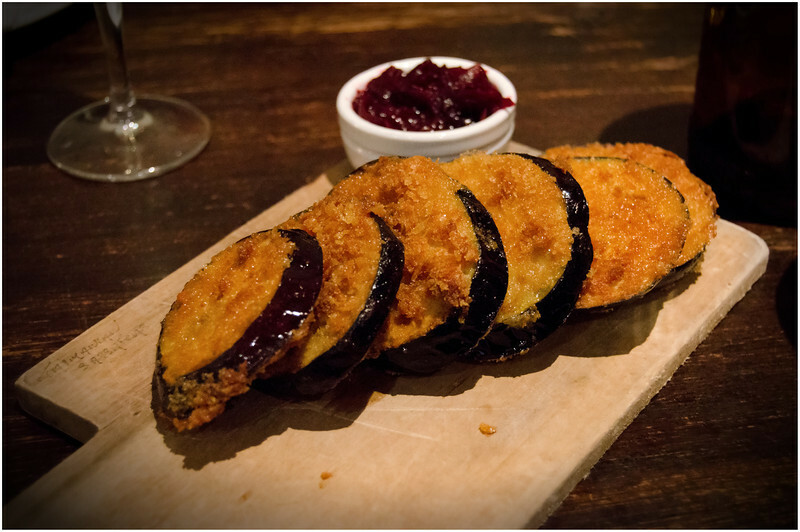 For entrée we were served crumbed eggplant wedges with beetroot jam. At first glance I was a little apprehensive about this dish when it was brought out. I’m not sure why, because it was pretty obvious in hindsight, but I wasn’t expecting them to be deep fried. On the plate I thought they looked very heavy and just a bit too ‘slick’ with oil, but when I took my first mouthful all concern dissipated instantly!! Deep frying can render a food inedible, or, if executed correctly and with care, it can elevate an otherwise plain ingredient to something greater. In this case, the latter!! Crunchy crust. Soft, light and fluffy eggplant in the middle…these were sensational!! I cleaned the plate up in no time, and wasn’t left with the usual post-fry heavy stomach. 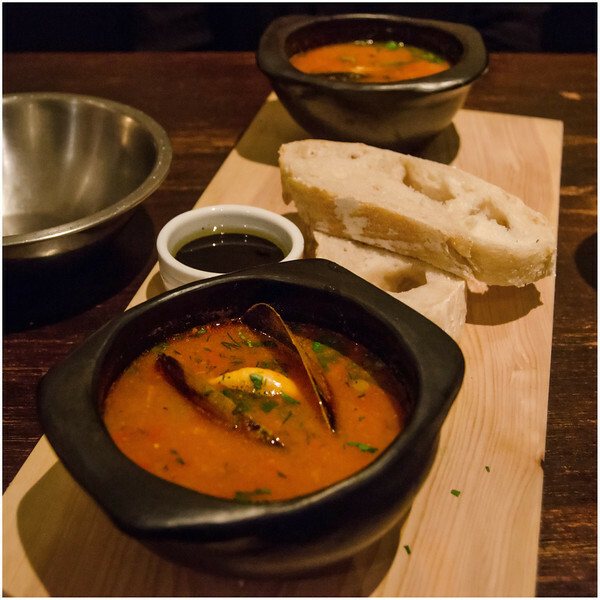 Our next dish was a fish soup with tomato, chilli and mussel. While not spectacular, it hit the spot on a cool autumn night! Perfectly cooked mussel (it’s greedy I know, but one more would have been nice) and a tasty broth with just enough zing to give it a good edge. This was then followed by seared venison fillet with spiced lentils. It looked great and tasted even better!! I’m not much of a lentil man (probably more mental than lentil if you ask my wife), but this was really good! 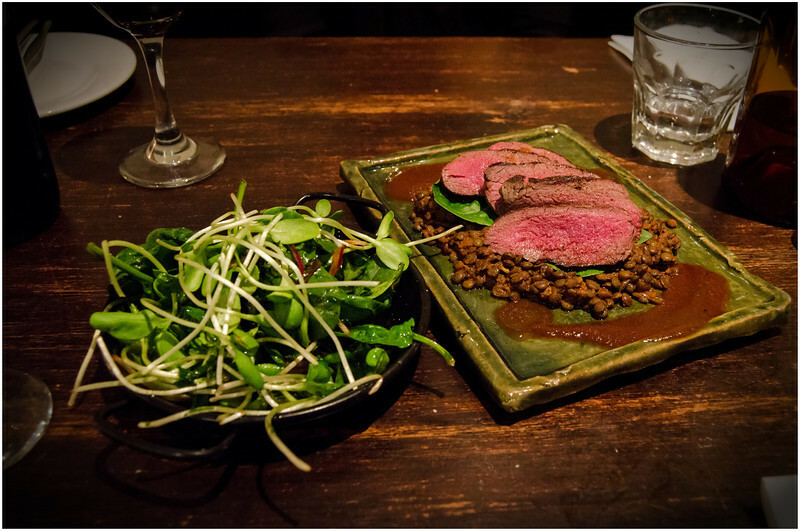 Full of hearty flavour, it’s rough texture complimented the perfectly cooked venison brilliantly. And ‘perfect’ really is the word to describe this venison! Medium rare, bordering on rare, it was incredibly tender, filling your mouth with a gorgeous hint of its gamey flavour. Probably the best piece of venison I’ve had. 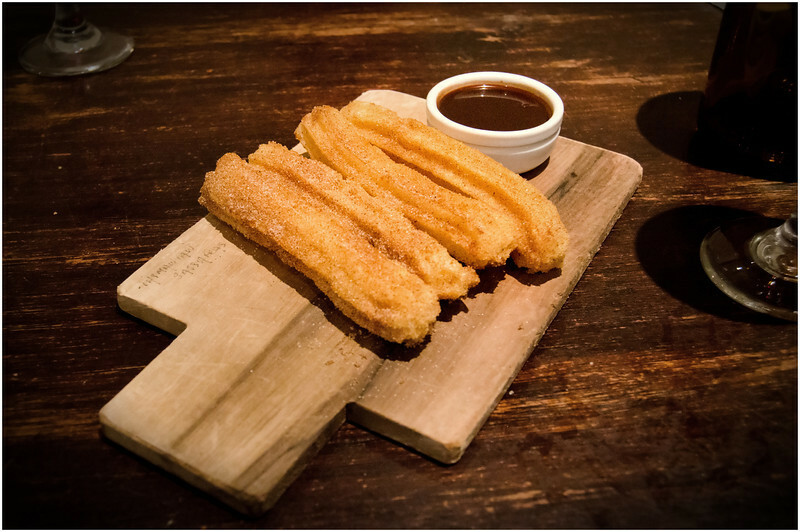 Finally, for dessert we were served a plate full of churros with chocolate dipping sauce! Another deep fried food, and churros in particular are one of those dishes that street vendors, restaurants and home cooks alike never seem to be able to get right. Soggy, dry and overcooked, maybe dripping in oil…there are numerous ways of destroying this dish! Overall it was a fantastic dining experience and Raincheck Lounge delivered the goods yet again! In our four or five visits over the years the service has generally been very good. The wait staff have always been happy to take the time to explain a little bit more about their dishes, or just have a chat. We did have one experience a couple of years ago where a number of our orders were either mixed up or not delivered. This normally wouldn’t have been an issue except that we were on a tight schedule to make sure we didn’t miss the movie later in the evening. The staff were very understanding though and after some unasked for adjustments to our bill we felt the issue was resolved really well. The ambience at Raincheck is also great. Busy most nights, there’s always a real buzz in the air that can only come from the mouths of content patrons! As a side note, while we didn’t have them on the night, the crinkle cut fries & wasabi mayonnaise produced by Raincheck would have to be some of the best in Hobart. Trust me, I know my chips! Oh my goodness, this looks like a perfect menu for me! You’re welcome! I hope you have managed to hear some of their new songs on their latest album, and if you get the opportunity to see them live you will have such a fantastic, memorable night!